Effective communication between patients and practitioners is fundamental to the delivery of high-quality care. This is particularly important in the complex and challenging nature of working in palliative and end of life care. Following specialist communication skills training, a group of healthcare professionals explored the impact of action learning (AL) on the perceptions of their knowledge, skills and confidence in communication skills. The research also aimed to establish an evidence base by exploring the nature and impact of the AL approach employed to facilitate improvements in professional practice. The research employed a mixed methods approach. Learners (n = 57) scored their perceptions in key areas of communication skills through questionnaires as a baseline measure at time point T0. From this group, 12 participants were selected to undertake further follow-up, divided into Control (n = 6) and Intervention arms (n = 6). All repeated the same questionnaire at 3 subsequent time points (T1, T2, T3) scheduled monthly. Half also received additional telephone-coaching conversation intervention based on Weber’s TLA® critical and reflexive approach (2014). To explore and assess perceptions, similarities and differences of their experience of undertaking the specific AL approach and processes, all completed participants (n = 4) and coaches (n = 2) were interviewed at time point T4 (33% response rate). Quantitative data from questionnaires was analysed for comparison of variables to provide a visual illustration of perceived learning journeys. Qualitative data from coaching conversations, interviews and questionnaire responses was analysed inductively to create final themes. Perceived improvements in knowledge, skills and confidence measured at 35% at time point T0, and improvement of 46% reported at time point T3. In the Control arm this was calculated at 25%, and at 67% from the Intervention arm. Findings indicate encouraging evidence for perceived improvements of knowledge, skills and confidence. The research demonstrates a positive appetite for, and experience of, the process and method. The value of such a solution-focused, critically reflexive AL practice suggests this may act as a facilitator for successful transfer of learning into practice for individuals and their organisations. Effective communication between patients and practitioners is fundamental to the delivery of high-quality care and practitioners’ communication skills can be improved through experiential learning . Research evidence shows that effective communication between clinicians and patients is not always an automatic by-product of clinical experience  therefore effective learning transfer into practice is particularly important in the complex and challenging nature of working in palliative and end of life care. Many training and development programmes within healthcare have embedded the process of including action into curricula, drawing upon important works [3–9] to foster motivational intrinsic behaviours to enable practical application after training is completed. However, the close relationship between action and learning which became systematised through important works, such as Revans’ [10–12] saw a shift in focus in the methodology and process of action learning, using change as an iterative process to help solve complex, critical, and urgent problems [13, 14]. Successful and effective learning transfer can be guided by a shift in the behaviours that course participants focus on at the end of skills training. A reflexive and action learning approach can facilitate not only short term skills improvement but extends learning towards change management [15, 16]. Therefore the research was designed as an initial study in 2016/2017 to explore the nature and impact of action learning with a group of healthcare professionals following their training in specialist communication skills for Palliative and End of Life Care. 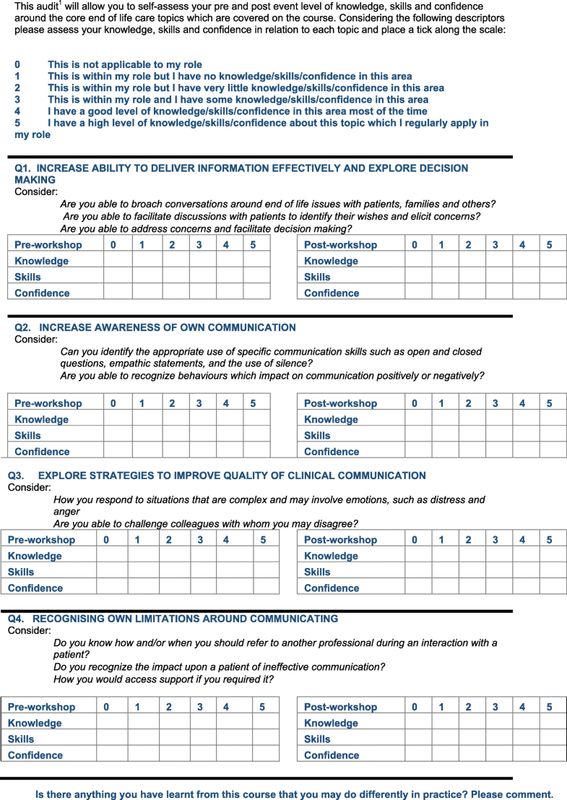 By measuring any changes in the reported levels of knowledge, skills and confidence over time, and exploring any differences in those perceptions, the research was able to assess how, and to what extent, the specific AL approach may facilitate improvements to professional practice for this group of healthcare professionals. Additionally, learners’ experiences and perceptions of this approach may indicate a level of utility for further development or refinement of future education and training provision in this area. The research employed a mixed methods approach, designed as a sequential and longitudinal study. Courses in communication skills training for Palliative and End of Life Care healthcare professionals are provided regularly throughout the northwest region of the UK and questionnaires are frequently used as a self-assessment tool for course participants themselves as well as course providers in evaluating course provision. However, to date there has been little or no published research exploring Weber’s (2014) TLA® intervention within medical and healthcare education. Therefore, this provided an ideal population to explore its potential impact. The methodologies employed in this research study were designed to increase the researchers understanding of the perceived levels of knowledge, skills and confidence that may occur at different time points, and how a specific action learning intervention may facilitate learning transfer into practice. Fifty seven participants from a variety of disciplines and healthcare settings undertook training in Advanced (ACST), Intermediate (ICST) or Core (CCST) Communication Skills, within the North West of England, between January and July 2016, as illustrated in Fig. 1. Participants attended the level of training based on their individual and organisational learning requirements, supported by the Cheshire & Merseyside Palliative and End of Life Care clinical network (C&MPEoLCCN) who co-ordinated training. Nurses were the only profession to attend all three types of training course provided. Medically qualified healthcare professionals attended only ACST training with health and social care professionals attending Core levels of training. Females represented over 90% of the participants and over half (54%) of the participants worked at healthcare organisations within the Liverpool city region. All 57 participants undertook a pre-validated questionnaire at time point T0, prior to course commencement (pre) and immediately on course conclusion (post). 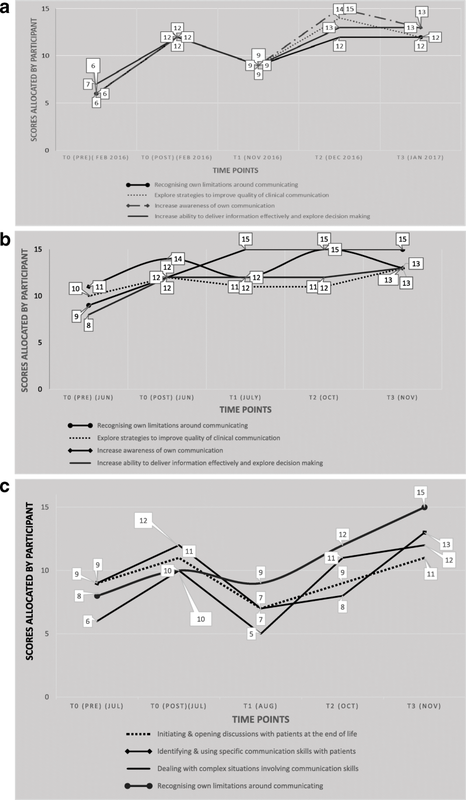 This measured their perception of their level of knowledge, skills, and confidence (KSC) in undertaking clinical care following their attendance and participation in the Communication Skills training course (Fig. 2). At the close of each course that took place between January and July 2016, the research study was presented to course participants. All participants provided written consent for their data to be used for the dual purpose of providing the researcher with a baseline measure at T0, as well as for standard course evaluation purposes. For the follow-up aspects of the study (T1–4), 12 healthcare professionals were selected from the group of 57. The study received full ethical approval and additionally R&D approval from relevant NHS Trusts before the first course was undertaken in January 2016. The questionnaire shown below is an example of the questionnaire used for ACST course participants (the majority of participants), and shown for time point T0. The same questionnaire was used throughout all time points, and was adapted for participants undertaking ICST and CCST. It can be seen that although the main assessment mechanism utilises a self-assessment scoring approach, there is space for free text ability and this was encouraged at all time points. To compare any differences in employing Weber’s (2014) TLA® AL approach, the 12 research participants were divided randomly into two study arms, Control, and Intervention. All participants completed repeat post-course questionnaires at scheduled monthly time points (T1-T3) after their training in Communication Skills at T0. Intervention arm participants received additional telephone-based coaching [15, 16] at the same time points. To assist with reflexive learning, all participants were provided with an action planning template [15, 16] (Fig. 3) and if they so wished, participants could choose to use this for reflexive purposes when completing questionnaires and/or preparation for telephone coaching discussions. Triangulation through open ended, semi-structured interviews  at the end of the action learning process (T4) was employed to obtain completed participants’ perspectives on their experience of the process. This included exploration of any potential facilitators and barriers to the use and feasibility of follow-up action learning processes for future participants following training provision. Additionally, the perspectives of the coaches providing the intervention was also sought via semi-structured interviews, to elicit their thoughts around the process and potential feasibility and/or further development of the concept for future use. It was important to explore the experience of coaches, particularly as the specific mode and features of the TLA® coaching method had not been used before within study coaches’ practice. Data from all questionnaires received from participants at all time points was analysed for comparison of variables and analysis undertaken (for nominal data) and correlation for possible relationships and emerging themes. Data was analysed descriptively to summarise the information from each of the questionnaires, providing median scores where appropriate. Free-text responses were also recorded from returned questionnaires as well as pertinent information that was elicited through semi-structured interviews at time point T4 with participants and coaches which made use of a topic guide created by the researcher. Interviews took place 1 month after each participant completed their study arm and focused on the experience in undertaking reflexive action learning processes (participants) and providing the specific AL intervention (coaches). All coaching sessions (n = 9) and interviews (n = 6) were audio-taped, and then transcribed verbatim by the researcher. The transcripts were analysed using thematic analysis to support creation of themes  and exploration of possible points of commonality, similarities and/or differences between participants. Results are shown below divided into quantitative and qualitative results collected and analysed at each time point T0 to T4. Scoring undertaken at baseline (T0) from the full dataset of 57 learners demonstrate effectiveness of training, measuring at an average of 35% improvement in perceived levels of knowledge, skills, and confidence, as shown by Fig. 4. Scores ranged from 16 to 60 (maximum score) at pre-course data collection and 32–60 at immediate post-course. The overall trend shows that 92% of learners measured a perceived positive change (improvement) in score from pre- to post-course. 6% of learners perceived no difference in knowledge, skills and confidence, and 2% deemed learning had not improved following training. These results provide evidence of significant perceived learning following training, in and of itself, but importantly, serve as a vital baseline measure for the research for scheduled follow-up (time points T1 to T3). The overall average measure of perceived improvement was calculated at 46% based on participants returning questionnaires to time point T3. The Control arm’s combined improvement score measured at 25% and the Intervention arm’s at 67% improvement from pre-course to the ends of their respective learning journeys at T3. The following graphs (Fig. 5 a, b and Fig. 6 a, b, c) illustrate the learning journeys as experienced and reported by each completed participant and are shown by study arm. The intention for all participants was to return the questionnaires at T1 (1 month after training), T2 (2 months after training) and T3 (3 months after training). As demonstrated by the individual learning journeys, timely returns of the questionnaire were variable and whilst some participants adhered to the requested time points, some did not. This is indicated in each graph. 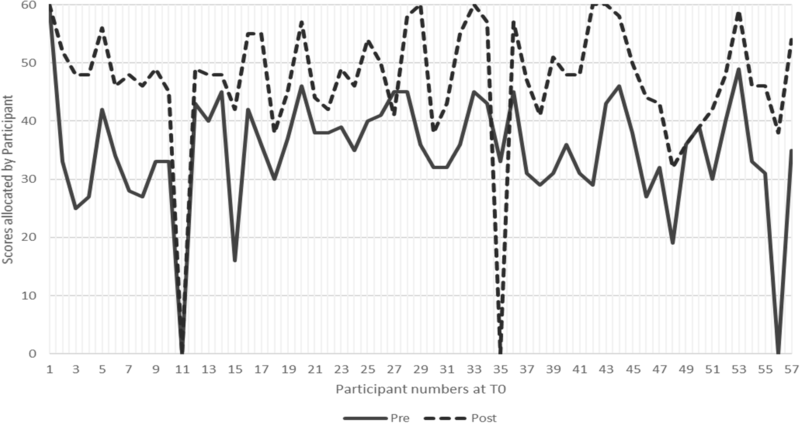 Despite being assumed “lost to study” through non-return of data at time point T3, the learning journey experienced and reported by participant C2 nevertheless warrants inclusion, not least to show the contrast with participant C1. For the participants within this study arm, an average measure of 25% perceived improvement in levels of knowledge, skills and confidence was reported. Although this data suggests a lower than average overall improvement, the learning journey for these individuals is nevertheless clear and qualitative data at time point T4 supports the value of the approach by the participants themselves. 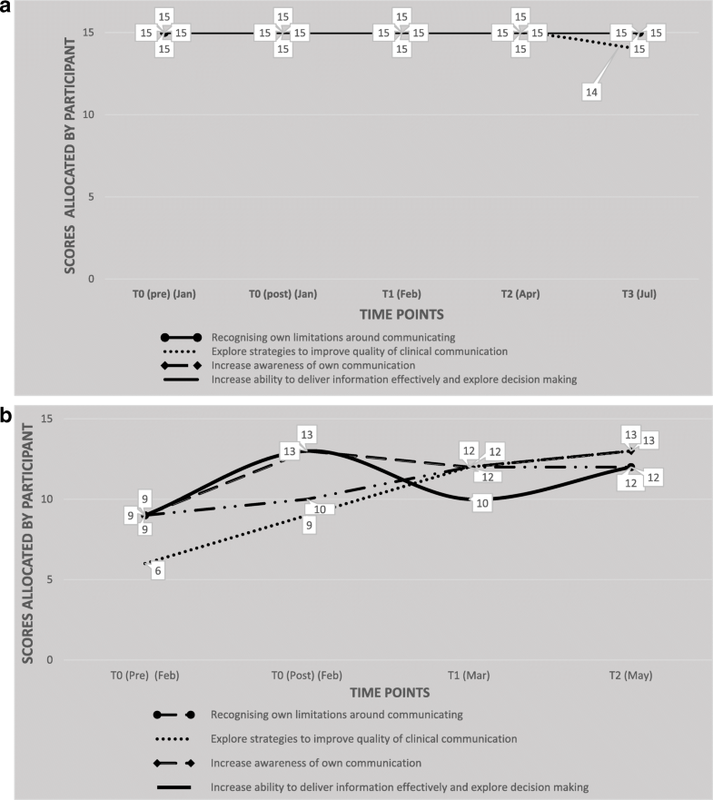 The average measure of perceived improvement for completed participants in the Intervention arm was calculated at 67% from T0 to T3, demonstrating a significant perceived increase in all areas of knowledge, skills and confidence. This is further evidenced by reflexive comments within the questionnaire returns as well as through final interviews with all completed participants (n = 4) and coaches providing intervention (n = 2) as per Table 2. Have never been asked to reflect on my thoughts after a communication skills training, it was first of its kind. (It) made me come away and think about what else I could do to introduce into my professional practice and I will follow that up (CONTROL PARTICIPANT). Rich data was collected via semi-structured interviews at time point T4, and brought together with qualitative data collected from questionnaires at time points T0-T3. This was analysed inductively and supported the creation of several important themes, with respect to the experience of action learning processes and activity, use of reflexivity within and outside of coaching, and the responsibility for learning and development, even with the accepted challenges and constraints of time and logistics. These were then grouped by theme as can be seen from Table 2. Through the qualitative data gathered and analysed from the questionnaires and interviews, using Creswell’s  framework, it can also be seen that that the application and process of action learning and reflexivity during all time-points was considered useful for all study arm participants. This provided a foundation for the perceived utility and feasibility of action learning processes and method in facilitating effective learning transfer. In some instances, this has had a catalytic effect for motivation for immediate and planned improvements in professional practice, as well as generating ideas for ongoing improvement and planning for longer-term team benefit. It is important to combine the results of both quantitative and qualitative data at time points from T0-T3 to understand the current state of play for a particular cohort of participants, or an individual, at specific points in time. Participants were given the opportunity to reflect on the process of follow-up as well as their experience of it, thus enabling a deeper level of understanding for their own self-development, as well as acting as a triangulation  method for the research study. Therefore, in consideration of the combined data, the main outcome of the research demonstrates that, even with small numbers, there is clear evidence of higher perceived and reported levels of knowledge, skills and confidence for the majority of participants. Inferences may be drawn between the relationship between perceived levels of knowledge, skills and confidence for those who undertook the intervention and those that did not, accounting for any bias and restrictions or limitations found during the course of the study. The general improvement from baseline to completion for Intervention participation (that was calculated from 35 to 67%), reinforces the idea that individuals within communities of practice can facilitate and strengthen collective learning . Importantly, qualitative data from participants demonstrates that data collection processes and methods, whether intervention or control arm, provided learners with conducive conditions and a safe place to face anxieties of real-world problem solving, enabling reflection and subsequent personal and professional development [20–22]. Each participant, whether in the Control or Intervention arm of the study, used his or her own lived experience  applying interpretative analysis  to improve individual professional competency .Through the process of action learning and participatory practice-based research , individual knowledge and know-how was able to be expressed, perceptions and assessments of “self” and “organisation” were legitimised, ensuring that action planning for improvement was fully contextualised [27, 28]. This facilitates and contributes to bridging the gap between knowing what and knowing how to convert theory into practice . The combination of iterative process and action of transferring knowledge into practice is a prime example of the SECI  model in action which addresses the needs of both individual and organisation in terms of improving knowledge, skills, and confidence to deliver an important clinical service at perhaps one of the most challenging times of life. The results of the study also suggest organisational learning may be strengthened by the notion of transformational, intra-, and inter-organisational learning, which resonates with learners and those designing learning for meaningful and demonstrable change. Thus, action learning can be perceived to have utility as both a method and a process for healthcare professionals, their line managers, service-design professionals and ultimately service-users. Successful transformative learning from effective communication skills can only occur within organisations and across systems by bringing together the needs and expectations of these diverse stakeholders [26, 31]. Learning from exploration and innovation is most likely to take place within a culture that values knowledge and innovation  and necessarily involves the discomfort of experiencing uncertainties, risks and ambiguities associated with iterative processes of potential change . The type of learning occurring within the research is indicative of the double-loop learning  that utilises reflection on the learning process itself. This is evidenced by participants consistently describing their satisfaction with the process and its feasibility in seeking to determine insight. This indicates a shift from explicit knowledge to tacit and implicit knowledge [35, 36]. This is the point at which learning becomes “transformational” [37, 38] as underlying patterns of thinking change shape and lead to an informed change in behaviour, as evidenced by perception from some participants. When transformational learning occurs from individuals to their environments, this can act as a catalyst for the direction of knowledge to change, and its outcomes become more securely integrated into existing and new knowledge sets within specialised communities of professional practice . Using knowledge and experience of participants from their own professional clinical practice as a foundation, a collective competence in communication skills may have formed the basis of a professional identity with specific insights found from the data . It has been said that coaching is informed by, and utilises a set of psycho-dynamic, goal-seeking and solution-focused principles [41–43] and that the coaching relationship is “one in which coach and coachee form a collaborative working alliance, articulate goals and develop specific action steps designed to facilitate goal attainment.”  Findings from this study arising from telephone-based coaching sessions are evidence of a strong behavioural solution-focused approach, with participants planning and executing actions, reflecting, and viewing success and continuing to evaluate next steps in the execution of professional duties. The ability to engage in constructive-style thinking of solutions is of particular importance when working in organisations that are in a state of flux and change . Although the focus was not strictly connected with resilience, dealing with setbacks, and feeling an increased sense of personal mastery as challenges began to be overcome. This appeared to be an additional value-added benefit of coaching, which can also help to reduce general anxiety and stress, as seen in feedback from Intervention participants [45, 46]. Additionally, data from coaches’ perspectives triangulates well with participants’ perceptions, with coaches agreeing that, although variable, participants generally demonstrated a positive attitude to receiving coaching and held its value in high esteem. This is despite logistical challenges with diary availability and the relatively short time space for delivery (30 min). Even with differences in personal coaching styles and the experience in providing the intervention to participants, there is a positive appetite for the utility and feasibility of this type of action learning approach. Given the lack of time and conflict with professional duties, agreeing to participate in this study may have compromised reflexive effort for some participants, and this may have been part of the reason for the numbers withdrawing or “lost to study” but without further investigation, this assumption cannot be proven. Other factors may have also contributed to the success (or otherwise) of levels and nature of completion rates. For example, the research study may have appealed to the personality and preferred learning styles of participants . Participants with a more reflexive preference may have been more motivated to join a study offering these opportunities, or those without may have been deterred from engaging in such activities. Although the research was conducted according to ethical standards, utilising a consistent approach to data collection methods and processes, it is difficult to establish if non-verbal communication encouraged a skewed response to demonstrate a favourable response to the research in question. Without independently assessing researcher and/or participant bias, reliability and validity  cannot therefore be fully established. The study has demonstrated the notion of value and benefits of action learning as perceived by participants, triangulated and supported by the experience of those providing the intervention. Although more work is required on closing the gap between theory and practice  and between designing, measuring and linking behavioural outcomes, action learning can offer an innovative alternative to traditional forms of learning for sustainable change . Although numbers were limited, a positive experience reported by participants in both study arms provides assurance that action learning is feasible within this community of practice and could support effective learning transfer. The author would like to express grateful thanks to the participants of the study and the Cheshire & Merseyside Palliative & End of Life Care Network for their support and engagement. The data that support the findings of this study are available upon reasonable request from the corresponding author. JD – sole author. The author read and approved the final manuscript. Ethical approval was granted by the University of Liverpool, reference number RETH001003 22.1.2016, amended 13.3.2016. NHS ethical approval was deemed “Not Research” by HRA 31.12.2015, however, the questionnaire was recorded on the survey activity database at St. Helens and Knowsley NHS Trust, registration number 2061516. Written participant consent was obtained from all study participants, including coaches. Written informed consent for publication was obtained from all study participants. Fellowes D, Wilkinson SM, Moore P. Communication skills training for healthcare professionals working with cancer patients, their families and/or carers: a systematic review. Cochrane Database Syst Rev. 2003. https://doi.org/10.1002/14651858.CD003751. Kirkpatrick J, Kirkpatrick, W. The Kirkpatrick new world level 3, http://www.trainingzone.co.uk Accessed 14 Feb 2015. Weber E. Turning Learning into Action, https://www.trainingjournal.com/articles/feature/turning-learning-action Accessed 14 July 2016. Hildreth PK, Kimble C. The duality of knowledge, Information Research, 2002 http://citeseerx.ist.psu.edu/viewdoc/download?doi=10.1.1.102.7762&rep=rep1&type=pdf. Accessed 14 Jan 2015.